Quinoa and Zucchini Stuffed Peppers | Naturally. As promised, a recipe. But before I dive into this post, I just wanted to say thank you for the outpouring of amazing emails/comments after yesterday’s post. While the internet can be a place of chaos and angry people, it’s also an amazing tool to bring people together. So thank you, so much. Preheat broiler. Place peppers whole under the broiler and cook until soft and just starting to char, rotating as needed, for 1 to 2 minutes. Remove, let cool slightly, then slice in half from top to bottom. Lay pepper halves flat in a roasting pan. Preheat/lower oven to 425 degrees. 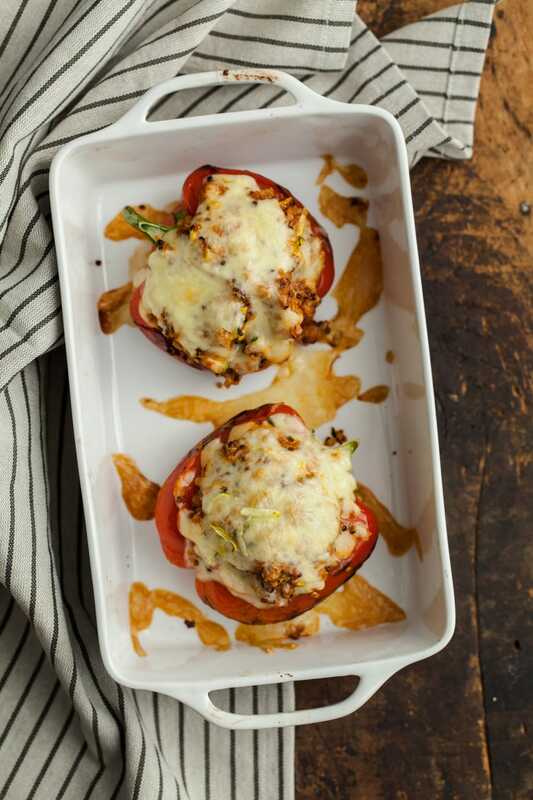 In a bowl, combine quinoa, shredded squash, basil, tomato sauce, garlic, salt, pepper, and half the cheese. Divide the quinoa mixture among the four pepper halves. Top with remaining cheese. Bake for 12 to 15 minutes, or until cheese has melted and is starting to lightly brown. Previous Post: « Life Happens. Oh man, I love stuffed peppers. My grandma told me a story about how when she first started dating my grandpa, she would cook him stuffed peppers in her tiny apartment, and he loved them. She would always try to make a few extra so she could have leftovers, but the more she made each time, the more my grandpa would eat! 😉 Every time I see stuffed peppers I smile thinking of them eating those stuffed peppers over 50 years ago! Yum! I LOOOVE stuffed peppers, and especially this vegetarian variety, since sometimes they have shredded beef in them. Love the use of quinoa and zucchini instead! 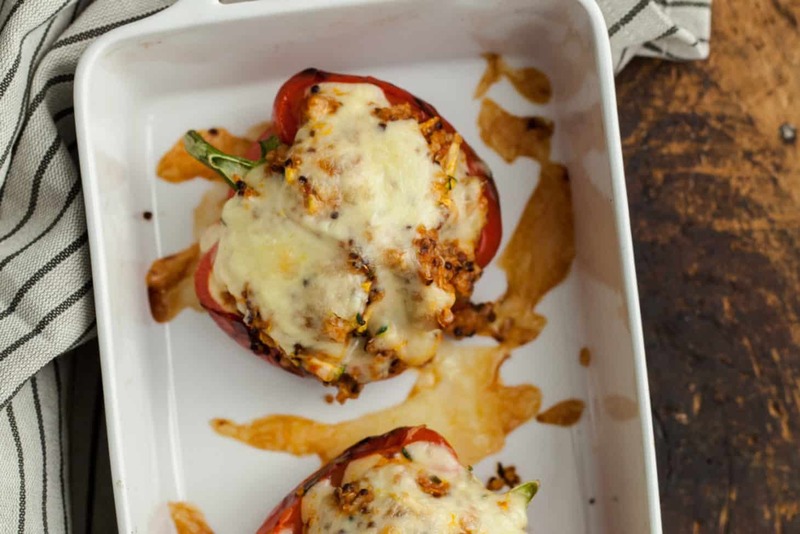 Love quinoa stuffed peppers!! I like mine spicy and so we always add red pepper flakes. Delicious! Loving this idea. SO yummy! Love this recipe. it reminds me of an Armenian dish my mo mused to make. stuffed pepper look so good and wholesome. Always looking for quick but satisfying weeknight meals. 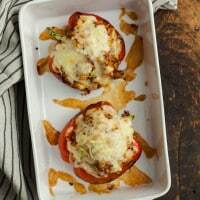 Love this fast and furious take on stuffed veggies! Looks great. I love the addition of zucchini and basil. These look delicious. I’ve made a similar dish but added some corn and onion. These are so versatile which is one of the many reasons I love them! Yuuum! Looks so so good! Love quinoa, could have it with anything, but in this recipe it looks even more appealing! Just had these for dinner. They are delicious. My husband, Mr. I hate quinoa, has asked for an encore appearance. Definitely yummy and to be repeated. The only change was I added some parmesan cheese to the quinoa mix. This is an easy meal with a complex flavor. That’s what I like to hear! Thanks for coming back and letting me know! Yay! Not only do these look amazing, but I’m SO thrilled I’ve found your blog! For the past several months i’ve been desperate to find recipes that fit my criteria AND look delicious and these types of recipes are, sadly, lacking. I want fresh meals, whole grain and produce based, no (or very minimal) meat and using seasonal ingredients. Lo and behold! Your food looks perfect. Why is it that all the “whole foods” blogs are full of meat and the “vegetarian” blogs are full of over-processed tofu weirdness? I’m desperate to feed my 6(!) kids healthy stuff that they like and it’s maddeningly difficult. Long story short: new reader here 🙂 Thanks again! I think we’ll do african curry tonight…mmmm! that looks great and sooo healthy. Looks like something i could add to my diet without any worry 😉 thanks for the recipe. I rarely ever remove the seeds unless I’m working with a chile where the seeds add unwanted heat! These were disappointingly bland. Needs more oomf to be satisfying, add somekf your own spices if trying this recipe. So sorry to hear that (especially given quite a few people have made this without disappointment). I’d recommend upping the garlic/basil if you really feel it needs it though! this is one of my favorite go-to recipes. for easter, my grandmother asked me to bring a veggie as a side dish. I’m going to make these, but a mini pepper version! (so people don’t need to take a full half pepper).